Since 2011, Gate Sentry has been helping some of the country’s premier guarded properties address their security needs and cost concerns. 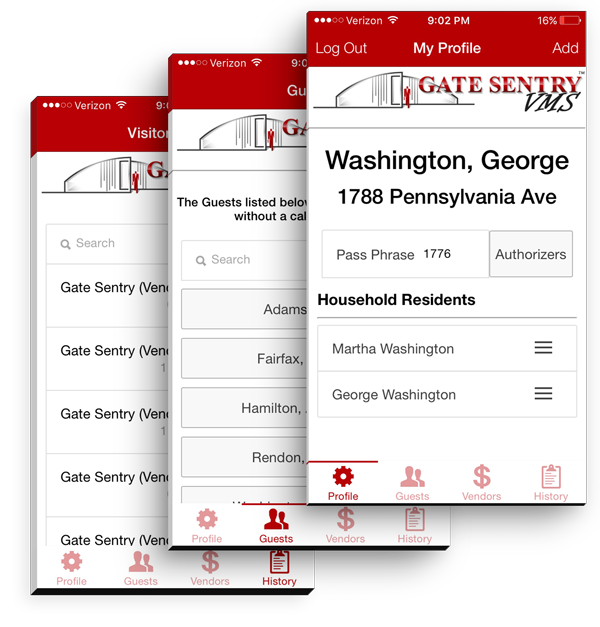 Gate Sentry is the leader in visitor management technology, harnessing the power of cloud computing and mobile applications to provide real-time visitor information to security staff when they need it most. This next generation visitor management solution is revolutionizing visitor access by linking residents directly to the security staff to provide accurate visitor information without the expense of added hardware or software. The cloud-based mobile system operates even when network connectivity is lost and allows residents to manage their guest list from anywhere in the world. Gate Sentry requires no capital for hardware laden systems, software licenses or expenses related to ongoing printing and maintenance costs. Just a small one-time implementation fee and monthly subscription. Easy to implement and simple to use. Contact us to learn more and see a demo of the system in action. The Gate Sentry leadership team is full of great people with a passion for what they do and insight from living and working in guarded properties. Collectively they have more than 100 years’ experience managing security of guarded properties. Every aspect of Gate Sentry’s development was created from the perspective of the host being visited, the visitor, and the security team managing guest access. Believing in the vision for a revolutionary new Visitor Management solution using the latest in mobile technology, Michael made an important decision to transition from a very successful career in corporate strategy with industry leading companies like American Airlines, Bank of America, Alcon Labs and Nortel Networks to develop and build a successful management team and an amazing visitor management solution in Gate Sentry. Michael was recently named the President and CEO of Gate Sentry and focuses on two key factors for growth: customer relationships and market strategy. Michael has a sustained commitment to community leadership and has served on the Boards of several for-profit and non-profit organizations. He is a member of the World Affairs Council, the Dallas Business Club, and was awarded the prestigious Marshall Memorial Fellowship in 2010. Michael earned a MBA from the Michigan Business School and a BBA from Baylor University and studied Economics at the WHU-Otto Beisheim Graduate School of Management, in Vallendar, Germany. Jack has more than 30 years of public affairs, marketing and sales experience for leading brands including 7-Eleven, Inc.; AAMCO; The Franklin Mint; and Amway Corporation. Active in the arts, education and human services, Wilkie has held volunteer leadership positions with The Gerald R. Ford Foundation, The Wellness Community, International Franchise Association, Southern Methodist University, and Education is Freedom. He currently serves as President of jobs4america. Louis Shanks has over 20 years building, managing and developing complex systems that support physical and cloud based environments. During his 15 year tenure with Microsoft, Louis worked with Fortune 100 companies solving their most difficult issues impacting millions of internal clients and countless web visitors. Louis also built a number of high performing teams that delivered deep technical debugging support and consulting for all Microsoft customers. Louis has also built a number of web based solutions for small and medium sized business. Chris Byers has been active in the software industry for more than 14 years starting with U.S. defense contractors working on unmanned vehicles and flight simulators. Chris joined Gate Sentry in 2012 as the integral leader of the development team from initial design through deployment. He graduated with a BSEE and was awarded the distinguished DirectX MVP award from Microsoft. Chris has authored tutorials for Lynda.com and is widely-regarded as an expert in Unity 3D. Katy is a high energy and results-driven professional with more than 5 years teaching and customer service experience with retail and business-to-business sales. She develops corporate marketing and internal communications for Gate Sentry target customers creating content around technology and guarded property security. Her excellent planning and organizational skills, combined with a passion for customer service, result in the optimum functioning of the sales and marketing department and the consistent achievement of outstanding customer experience. A native of Illinois, Katy resides in Flower Mound, TX. Call us today at 800-975-5971 or fill out the form above. Newer. Faster. Most Affordable Visitor Management System.